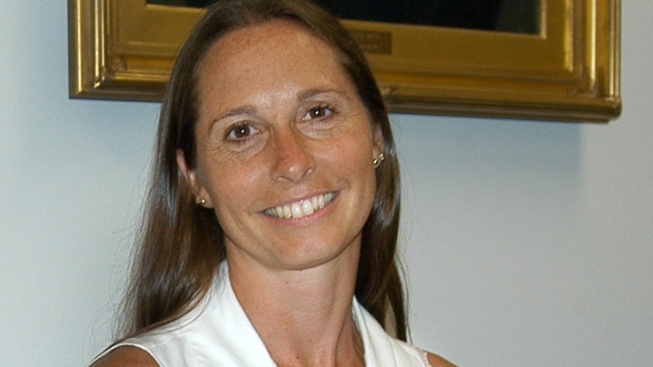 This July 2010 photo provided by The Newtown Bee shows Dawn Lafferty Hochsprung, principal at Sandy Hook Elementary School, in Newtown, Conn.
Sandy Hook Elementary principal Dawn Lafferty Hochsprung is being remembered as an energetic and dedicated educator. Upon hearing gunfire at the school during Friday morning’s shooting, Hochsprung, 47, along with the school’s psychologist, Mary Sherlach, ran toward the barrage of bullets to protect students, NBC's "Today" show reported. Adam Lanza, 20, the alleged shooter, entered the school that Friday morning, and by the time his shooting rampage ended, 20 small children and six adults had been killed. Hochsprung was one of the victims, NBC News has confirmed. Diane Day, a therapist at the school, was with Hochsprung, Sherlach, a parent and other staff members at a meeting when she heard gunshots, according to The Wall Street Journal. Then Hochsprung and Sherlach rushed from their seats and ran out to help, Day told the Journal. "They didn't think twice about confronting or seeing what was going on," she said. “She’s a hero today,” Gerald Stomski, First Selectman of Woodbury, Conn., who knew Hochsprung, said on "Today." Conn. Massacre Second-Deadliest School Shooting in U.S.
Hochsprung had been principal at Sandy Hook Elementary since July 2010. She took on that position with 12 years of administrative experience behind her—six of which were served as assistant principal within the Danbury Public School System; five years at Rogers Park Middle School; and one year at Danbury High School, according to The Newton Bee. Hochsprung was married with two daughters and three stepdaughters, according to the Bee.